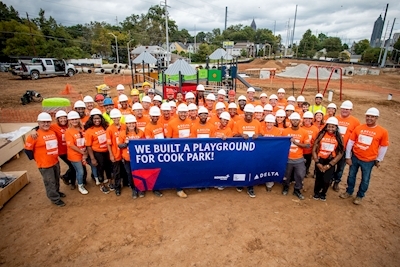 In the rain, wind and cool temperatures, 75 employees volunteered to help build a Delta sponsored playground in Cook Park on Saturday, Oct. 20 in downtown Atlanta. The Rodney Cook, Sr. Park is a key part of the revitalization efforts of Atlanta's Westside community in the historic Vine City neighborhood, which is where the home of the late Dr. Martin Luther King, Jr is located. As the City of Atlanta's newest recreational public green space, Cook Park is set to open in 2019 and is a joint venture between the City of Atlanta, the Westside Future Fund, The Trust for Public Land and the National Monuments Foundation. The Delta Air Lines Foundation contributed $1 million toward the park's creation with $500,000 going to the Trust for Public Land for the specific development of a playground and $500,000 going to the National Monuments Foundation that will install monuments honoring historic Atlanta leaders. "We're really ex​cited to be working with Delta," said George Dusenbury, Georgia State Director of the Trust for Public Land. "One of the main goals of the Trust for Public Land is to have a park within a 10 minute walk of every urban resident in America, so this park is key to meeting that goal in Atlanta." Delta people spent the day working with representatives from the Trust for Public Land and construction company Kompan Playgrounds. After mixing concrete, the team assembled a few parts of the colorful playground, such as slides and seesaws, to show residents that the playground is officially underway. Volunteers also built a variety of pieces that will be assembled closer to the park's opening in 2019.